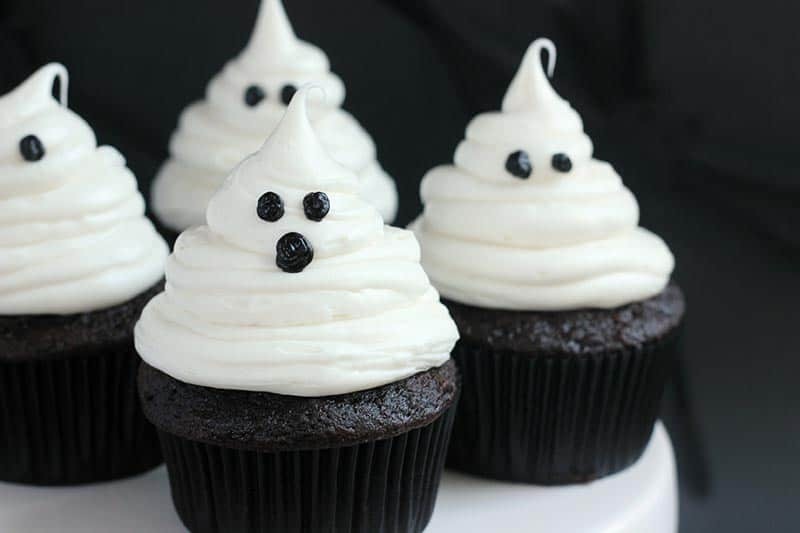 Easy Halloween Ghost Cupcakes. 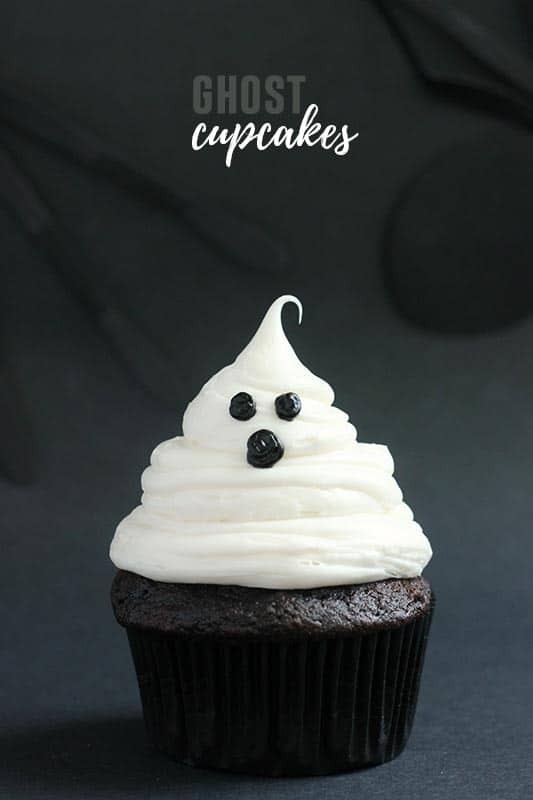 Dark chocolate cupcakes topped with vanilla buttercream and black frosting make the perfect spooky Halloween treat! Halloween is one of my favorite holidays. Getting dressed up, passing out candy, and watching my little guy fill with excitement is the best. How adorable are these little guys? When it comes to making themed desserts I always try to stick with two simple rules: It has to be simple and it has to be cute. These fill both of those categories! It takes a whopping 30 minutes from start to finish. The best part? Imperfections make these even better. No need to make them all match or worry about your pipping skills. If you can swirl your wrist you can make these cupcakes. 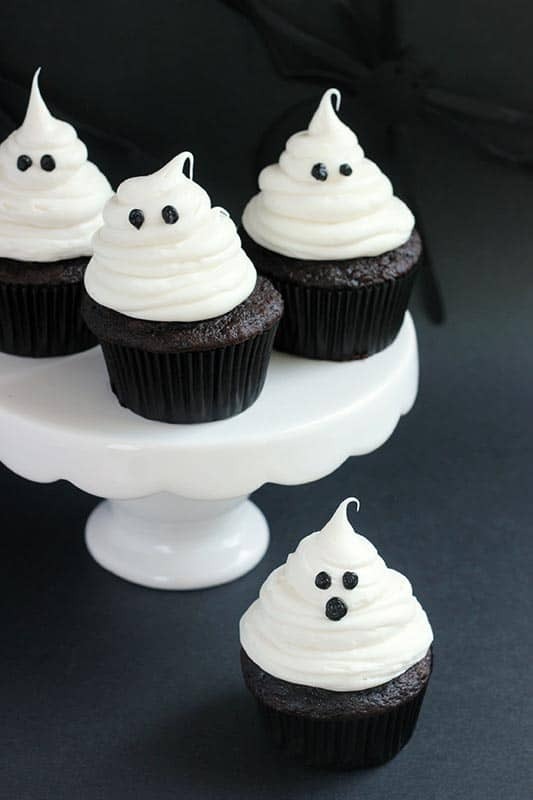 Top them with vanilla frosting or buttercream using a large round pipping tip. Add a small round pipping tip and coupler to a tube of black frosting. Pipe eyes directly onto your frosting. Preheat your oven to 350 degrees. Line 2- 12 count muffin tins with paper liners and set aside. Combine the first seven ingredients in a large bowl. Mix until fully combined. Fill your cupcake liners 3/4 full. Bake 15 minutes or until a toothpick comes out clean. Cool completely. Prep a piping bag with a large round pipping tip. Fill with your vanilla buttercream or frosting. Pipe the frosting on top of your cupcake until you have a nice tall dome. Don't worry about it being too perfect. The imperfect ghosts look the best! 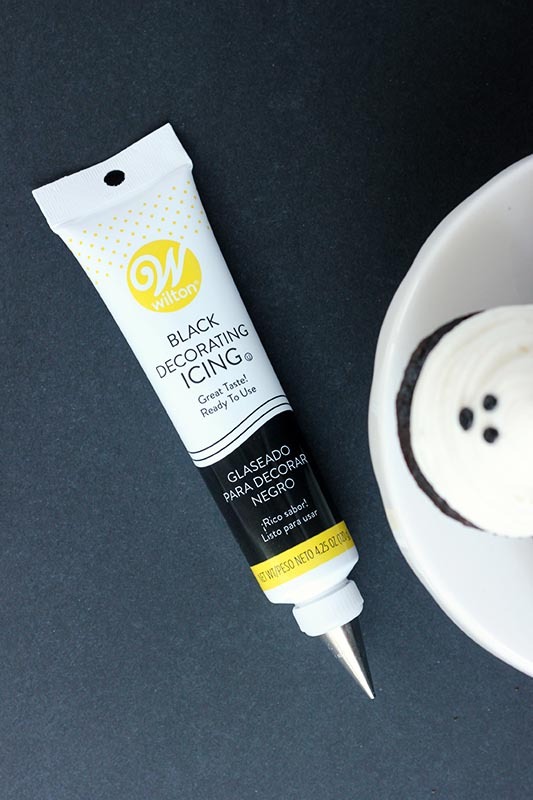 Using a small round pipping tip and black frosting, create small eyes directly onto the frosted cupcakes. Just being honest here, well first. Adorable. Seriously, those ghosts. Love. Second, your instructions are a little confusing, I was like fill the cupcake liner with what? Then I figured out it was the brownie batter but it might help to clarify that. Third, brownies and ice cream together is genius, and in these cute little personal edible ghost form? Even more genius. They turned out PERFECT! And I like the i(ce) scream. It’s just what it needed! You are a genius for that by the way! Thank you!! 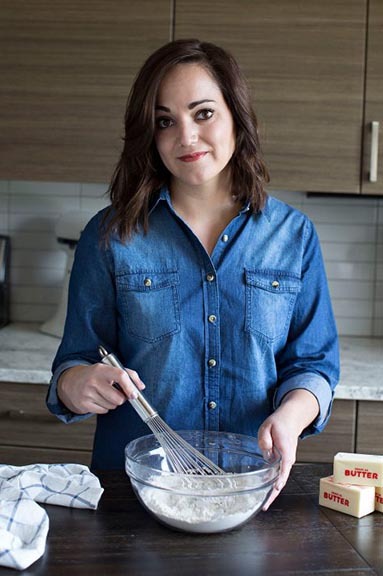 Just saw your link on Utah Bloggers and had to stop by and check out these cute little treats! Pinned while I was here too! I LOVE this, absolutely LOVE – it is adorable!! Pinning! Oh I love this!!! So fun and love the title! Pinning! These are so much fun! I agree that your title is way fun! Saw this on The Utah Blogger and I think you were at the SEO thing last night. Your site is way cute! You are amazing. These cupcakes are perfection, seriously. Those are so cute! My grandsons would love them!! That ice cream sounds great too. I think I’m going to go find some… Dang You!! You’re mind it’s amazing. These are so freaking cute and they sound just delicious! they are BOO tiful 😉 HA! totally cute and kids would love them! (and I eat ice cream year round so it’s PERFECT! These are adorable and they look divine!! You really are amazing! These are SO cute!!! And so yummy looking!! These are so cute. Might have to make them for my Halloween party. Thanks! These are so adorable and simple. I can’t wait to try these for the little ones. I love your blog. Thanks for sharing.